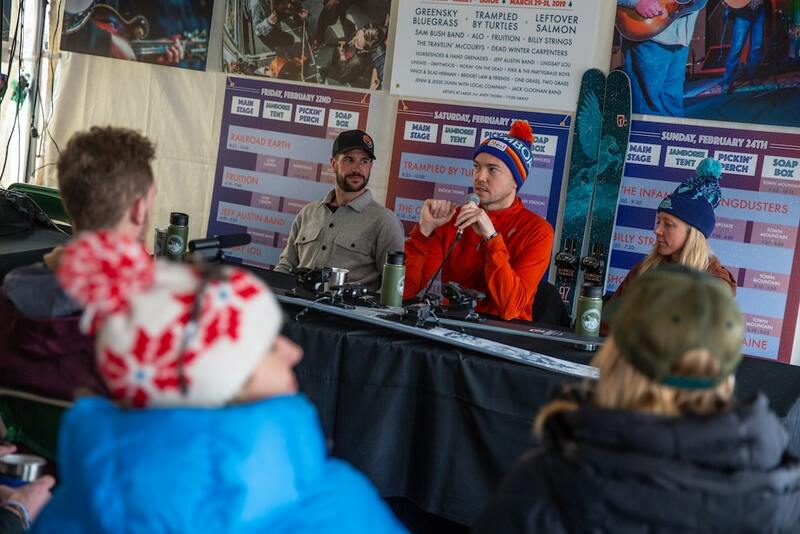 The “Marriage of Music and Skiing” panel discussion featured hosts Bobby L’Heureux (Big Heart Big Hands), Chris Pandolfi (The Infamous Stringdusters), and Annelise Loevlie (CEO of Icelantic Skis). Big Heart Big Hands was started after a friend of Bobby’s, Jarod Wetherell passed away while hiking Maroon Bells. Originally the idea for the non-profit was to support rescue organizations, and they still continue to do that. The organization grew into focusing on education by partnering with guide companies. Last year, clinical psychologist Jessica Heaney offered her services to BHBH. So if you’ve ever been involved in an incident, or you rescued someone, or a friend or family member has been involved, and you log on to the BHBH website, you can fill out a form to be directly connected with Jessica for emotional impact help. So of course, we were thrilled to have Bobby participate in this panel alongside Chris and Annelise. The work they do at Big Heart Big Hands is so hugely important to the ski community, so to have Bobby out to the festival was a great chance to give back to them. Pandolfi went on to describe how the Dusters first got connected to Icelantic. They were in Grand Targhee for their ski tour on a huge powder day. They offered free tickets to their shows to whoever could hook up some demo skis or lift tickets. So he ended up on a pair of some Icelantic Nomads. He got online later that day and sent an email to them, thrilled about a great day on these Icelantic Skis. The email ended up in the inbox of Sales Manager Ashley Hart, who according to Chris “took my stoke and multiplied it by ten.” A great relationship began between the Stringdusters and Icelantic, and built on all the overlap between the things that are natural to both worlds.